Toronto Mayor John Tory wants to funnel billions in federal funding to the downtown relief line and push ahead with the nearly $4-billion Scarborough subway project, while acknowledging that the Ontario government’s intention to change both projects could upend any progress. In nearly 350 pages of long-awaited reports from city staff, new details were revealed Wednesday on the costs of several major transit projects that have been proposed. The relief line is now projected to cost about $7.22-billion, several hundred million more than the previous estimate. Mr. Tory is supporting the staff recommendation that about $3.1-billion in money from a federal transit fund be earmarked for this project. Another $500-million in federal money would be dedicated to expanding the overcrowded Bloor-Yonge subway interchange. “As the report makes clear, this is a critical moment to actually push ahead and build transit,” Mr. Tory told reporters at a media event in that station. The reports also confirm that the original plan to build both a subway extension and a light-rail line in Scarborough as a two-for-one package is no longer financially viable. The subway cost, which was recently revealed to have climbed to around $3.9-billion, has eaten up all the money that was to pay for the LRT, which is mentioned in the report but has no funding attached to it. The rise in the subway cost has pushed it past the $3.56-billion previously approved by council. Staff are suggesting the extra cost could be financed through debt supported by an existing citywide levy and development charges. 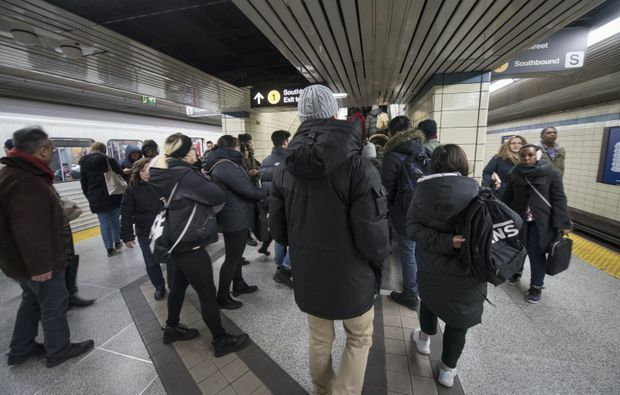 Both the relief and Scarborough subway projects face an uncertain future, though, amid provincial plans to take over subway ownership and expansion planning. Transit blogger Steve Munro said that the big question hanging over the city’s plans is Queen’s Park’s lack of clarity over what it has in mind. “There really needs to be more detail from the province,” he said. Speaking to reporters, Ontario Transportation Minister Jeff Yurek said the province would make use of whatever transit plans the city has, and revise them according to its own vision, once the subway upload is complete. He said he would reveal more of the province’s plans soon. Several aspects of the city’s plans need provincial approval. Most crucially, the federal funding that the city is hoping to tap for the relief line must be approved by both Ottawa and Queen’s Park. And the city is seeking a definitive commitment from the province, by the middle of May, that it will follow through on a funding commitment for the Scarborough project. In a statement, a spokesman for Mr. Yurek would not commit to either request. Mr. Tory reiterated previous comments that he would seek commitments from the province that their changes wouldn’t delay transit expansion. And he said he would look askance at requests to help fund projects if the city doesn’t get to keep the resulting transit infrastructure. “I can certainly tell you, my going-in position [in negotiations] would be that we’d have to think very long and hard, and I’d be very skeptical of a scheme whereby we contribute huge amounts of money to projects we don’t own,” he said. At his event, Mr. Tory declined to comment on the extent to which councillors supported the Scarborough subway extension only because it included the LRT as well. Helen Lee, a transit advocate who went to the University of Toronto’s Scarborough campus, called it “disheartening” that an LRT that would have served that school is no longer funded.